The PC market may be continuing its long, slow, downward slide, but there’s still a lot of money to be made there. Advanced Micro Devices, Inc. (NASDAQ:AMD) is the underdog to Intel Corporation (NASDAQ:INTC) in the battle to power those PCs, but in 2017 the company made a play to win market share with its new Ryzen CPUs. AMD stock hit five-year highs in anticipation of the original Ryzen, and now AMD has announced the second generation of its desktop computer chip. It’s faster and more efficient than the originals, and comes in at a lower price as well. Could this be AMD’s year to close the gap with Intel? 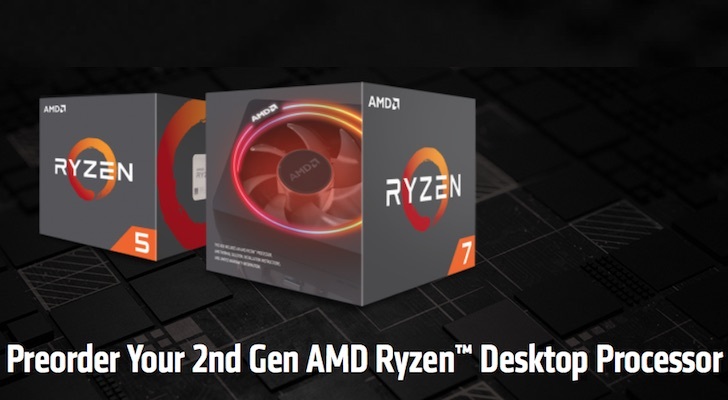 On Friday, AMD announced its second generation Ryzen desktop CPUs. They’re built on the same Zen+ architecture — the Zen 2 CPUs likely won’t arrive until next year — but AMD says they are faster and more efficient than ever. They’re also less expensive than the first generation. For example, the new flagship Ryzen 2700X offer 8-core performance at up to 4.3GHz for $329. It replaces the 1800X, which launched at $499. Can AMD Grab More Marketshare from Intel? Last year’s Ryzen CPUs were a big deal. They were designed to maximize multi-thread performance that gave them a boost for intensive tasks like virtual reality, and they represented AMD’s biggest serious attack against Intel in years. That helped to boost AMD stock. And the push has paid off. CPU Benchmark showed that after years of declining marketshare, AMD began tracking higher. At its lowest in Q3 2016, AMD was showing a 17.5% share, compared to 82.5% for Intel. By Q3 2017, AMD hit 22.3%, before losing a little ground as Intel released its new CPUs. The aggressive pricing of the second generation Ryzen lineup should help the company to make further gains against its rival. That 8-core Ryzen 2700X at $329 is going up against a 6-core Intel i7-8700K, which is retailing for $350. In addition, there’s the ongoing fallout from the Spectre and Meltdown vulnerabilities. AMD’s chips were revealed to be affected by Spectre, but Meltdown remains an Intel issue. Both INTC and AMD stock took a hit when the vulnerabilities were disclosed in January. But because it’s battling on two fronts (and is inside the majority of PCs), Intel is getting the worst of it. In 2018, new Ryzen CPUs are likely to benefit from the lingering fallout. AMD reported its best financial results in years for 2017, returning to full-year profitability, with revenue up 25% over 2016. And while video cards, and processors made for game consoles make up a big chunk of the company’s revenue, strong Ryzen sales contributed to that growth. In 2018, the company is expecting to build on an already stellar 2017. The new second generation Ryzen processors are a key part of that. AMD stock is at currently at yearly lows — thanks in no small part to Spectre and Fallout — but with new AMD Ryzen chips coming, it could be set for a recovery. The second generation AMD Ryzen CPUs will be in stores starting April 19. Article printed from InvestorPlace Media, https://investorplace.com/2018/04/second-generation-ryzen-cpus-position-amd-take-intel/.